Lisa Hobbs holds a picture of her husband, Gene "Pius" Hobbs. At the scene, state police concurred: they couldn’t hear the backup beeper. Later that day, after the employees had gone home and the Vine Grove street was quiet, Kentucky’s occupational safety inspector showed up. He conducted his own test. Standing next to the truck, with no other equipment running in the area, the inspector said he could hear the backup beeper just fine. Though those conditions bore little resemblance to the scene of Hobbs’ death hours earlier, the inspector ruled the Meade County Road Department had done nothing wrong. Hobbs’ widow, Lisa, got a copy of that email. Kentucky is one of 28 states or territories that runs its own worker safety program, called Kentucky Occupational Safety and Health (KY OSH). When workers die on the job, KY OSH inspectors are charged with investigating the circumstances of the death, and determining whether an employer was complying with state safety and health standards. But the state agency tasked with protecting workers failed to properly investigate nearly every single worksite death in two years, according to a federal investigation and analysis by the Kentucky Center for Investigative Reporting. The flaws showed up in almost all of the 44 fatalities examined by federal OSHA in fiscal years 2016 and 2017. The federal investigators sought to retrace state inspectors’ steps to evaluate the quality of fatality investigations. But they found a lack of information that made it impossible to know, in many cases, what caused a death or if a company should have been deemed responsible. Donta said he had trusted the people working under him, but in retrospect, realized he should have been watching more closely. There’s no excuse for a bad investigation, he said, but it’s hard to expect a struggling agency — underfunded, with high staff turnover and what he felt was a lack of political support from the state — to get it right all the time. What Lisa Hobbs wanted was for the state to do its job, and hold her husband’s employer to account. The problems in Kentucky’s state-led worker safety program are well-known to the federal government. In August, the federal Occupational Safety and Health Administration quietly issued a scathing audit known as the Federal Audit and Management Evaluation (FAME) report. In it, federal OSHA identified more shortcomings in Kentucky’s system than any of the 28 other states and territories that run their own worker safety program. The federal agency criticized the state for only investigating complaints that come from employees of a company -- which means 70 percent of the complaints they receive are ignored, because they came from non-employees. Overall, OSHA found, Kentucky is inspecting fewer workplaces than it ever has; the 787 inspections it conducted in fiscal year 2017 was the lowest number in at least a decade. When KY OSH does inspect workplaces, they’re identifying fewer hazards than in previous years, and the time inspectors take to close a case exceeds federal standards, according to the federal audit. Federal OSHA also took the unusual step of conducting a special study of Kentucky’s handling of worker fatalities, prompted by a spike in complaints from families and national advocates about KY OSH. In nearly all of the 44 cases it reviewed, the report found fundamental deficiencies. The flaws included failing to identify the cause of the accident, not conducting or documenting interviews and overlooking obvious violations. The federal Department of Labor, which oversees OSHA, declined an interview request. A spokesperson said in a statement that “OSHA is currently in the process of working with the Kentucky Labor Cabinet to craft a corrective action plan that addresses the findings” identified in the report. Although the state Labor Cabinet refused to make Acting Secretary David Dickerson or a representative of KY OSH available for an interview, its response to the federal audit sheds light on its defense. The cabinet acknowledged it’s implementing some changes, particularly around documenting interviews. But the cabinet rejected some of the findings outright and defended its investigations. Federal OSHA pointed out that Kentucky didn’t identify an incident’s cause in nearly half of the cases, and directed KY OSH to develop a strategy to ensure more thorough investigations in the future. In its response, the Labor Cabinet disagreed. It acknowledged that inspectors are ordered in the agency’s manual to make “every reasonable effort” to determine the cause of the accident, but said that didn’t mean it was required. Federal OSHA can take over state-run programs like Kentucky’s if they aren’t “at least as effective” as the national standards, but Jordan Barab, Deputy Assistant Secretary of Labor for Occupational Safety and Health during the Obama administration, said that’s unlikely. There are interim steps that federal OSHA could take, though, like withholding federal funds or taking over parts of the state program. The federal audit didn’t name the workers or companies involved with fatalities. But KyCIR obtained 47 case files from the state’s fatality investigations for fiscal year 2016 and 2017, including three cases that weren’t included in the federal audit. Our analysis confirmed the federal agency’s findings: few interviews were conducted, and inspectors often closed the case without determining what caused the fatal accident. The majority of the companies that were issued safety violations and financial penalties, meant to serve as a deterrent, saw their fines cut by at least half. In Gene Hobbs’ case, no violations or fines were issued. Meade County Judge-Executive Gerry Lynn called the death a “tragic accident,” and said the county was cleared of all wrongdoing. But records show there were serious shortcomings in the KY OSH investigation. The inspector never interviewed Turner, the sole eyewitness. He got no signed employee statements. His accounting of what Hobbs was doing at the time of his death — the inspector said he was walking back from lunch, not raking — contradicts what the state police reported. A passing vehicle fatally struck Titus Morris and injured another employee while they were conducting road work in Scottsville in December 2015 for the Kentucky Transportation Cabinet. The KY OSH inspector left the agency in the middle of the investigation, and witnesses weren’t interviewed for four months. Records indicate that the driver of the car involved in the accident was never interviewed. Because she showed up after the vehicles had been removed, and the employees hadn’t done a daily safety check, the inspector said she couldn’t figure out from available documents whether the crew was using proper safety precautions. But she said she had no reason to believe they weren’t. No violations were issued. Transportation Cabinet spokesperson Naitore Djigbenou said she didn’t know anything about a daily safety check in this incident, but said the cabinet requires all of its employees to comply with all safety rules. “It was a very, very tragic event that was really unforeseen and truly an accident,” said Djigbenou. In Louisville, Jeffrey Burke was crushed to death when the jacks failed while he was working on a car in September 2016. This wasn’t part of his job as a hotel maintenance worker at a Louisville hotel — Burke’s manager ordered him to work on his daughter’s car, records show. The KY OSH inspector didn’t interview the manager who ordered the work, who was fired by the hotel. He nonetheless decided the manager couldn’t be responsible for the safety violations, since he wasn’t on site at the time. In August 2016, Ervin Bledsoe was doing building restoration work for BJB Architectural Metal in downtown Louisville when he fell from a ladder. He ruptured his spleen and died the next day at the hospital. A BJB representative didn’t return a call for comment. The federal audit pointed out that KY OSH missed possible citations for a lack of ladder training; improper ladder use; and lack of management oversight. KY OSH didn’t ultimately issue any violations or fines. But, the agency had already offered the company a 25 percent “good faith” discount on fines before an inspector began investigating. More than 90 percent of companies investigated after a fatality in fiscal year 2016 and 2017 were offered a reduction on fines even before KY OSH decided whether violations occurred, according to KyCIR’s analysis. The federal audit concluded these reductions are often handed out without justification. One of those penalty reductions was handed out in direct violation of Labor Cabinet rules after 66-year-old Sally Berry was stabbed to death. Berry was working in a residential care facility in Elizabethtown owned by Louisville-based ResCare, now called BrightSpring Health Services. According to court records, Berry was killed by a resident she was supervising on the evening of January 3, 2017. The resident was indicted for murder, but the charges were dismissed by the prosecutor on competency grounds, court records show. While investigating, though, KY OSH issued a violation to the company for willfully failing to maintain required workplace injury records. It was the only time KY OSH issued a serious willful violation in the 2016 and 2017 fiscal years. The company was given a 15 percent reduction based on “good faith,” which KY OSH issues to companies with an effective, written safety and health program. But KY OSH’s manual says that “good faith” reductions cannot be assessed when the company has any willful violations, since the employer can’t willfully disregard safety regulations and be in good faith at the same time. 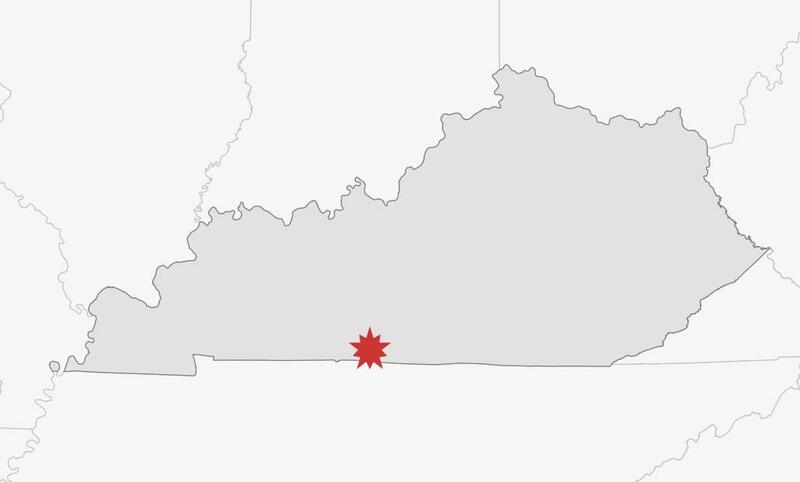 And even though the inspector documented at least 10 incidents of workplace violence in two years at the facility and cited ResCare for faulty record keeping, KY OSH handed out an additional 10 percent reduction on the strength of the company’s worker safety history. KY OSH issued a $14,750 fine to the company after the penalty reductions, according to records. That company paid its fine in full. But many companies don’t. One in three companies penalized after a fatality saw further reductions after an informal settlement meeting with KY OSH. These informal settlements are intended to encourage the companies to invest in safety, according to Mike Dixon, commissioner of the department that oversaw KY OSH, then called Office of Occupational Safety and Health during the Beshear administration. For nearly half the companies that had violations, KY OSH agreed the company fixed the problems during the course of the investigation. Beyond that, KY OSH typically doesn’t follow up in person after a company reports that it has addressed the problem. Dixon said the department is abdicating its responsibility if its no longer leveraging penalty reductions to fix worker safety violations. That’s why, Dixon said, employees need a strong worker safety agency looking after them. In public statements, Labor Cabinet leaders have highlighted the focus of the state’s worker safety agency. Enforcement is not the priority. KY OSH will come and assess a company’s safety program, for free, without the threat of fines or punishment. In 2016, the education division of KY OSH gave voluntary consultations to 334 businesses and offered training to approximately 4,400 employees, according to state reports. The education program helps businesses proactively identify and fix worker safety violations. Kentucky remains above the national average on workplace injuries and illnesses. But those numbers are declining, statistics that Ramsey cites as proof that education is working. The number of fatalities investigated by KY OSH has remained largely stable over the last decade, hovering between 20 and 30 workplace deaths a year. While the 20 fatalities in 2017 was the lowest number in a decade, the year before was among the highest at 27. Laura Stock, the director of the Labor Occupational Health Program at the University of California at Berkeley, said an opt-in, voluntary education program isn’t a long-term fix. “Without a really strong enforcement unit ... these voluntary compliance assistance programs are not going to be able to do the job,” Stock said. Though his education-first initiatives continue, Ramsey left the Labor Cabinet in May to head up the Kentucky Education and Workforce Development Cabinet. Ramsey took a lot of Labor Cabinet senior staff with him, including the commissioner and deputy commissioner of the Department of Workplace Standards, which oversees KY OSH. Ramsey was replaced with an acting secretary. KY OSH itself has had four different directors of compliance since Bevin was inaugurated in 2015. That turnover mirrors what’s happening at KY OSH’s lower levels as well. A quarter of all compliance officers have less than one year experience, while 63 percent have three years or less. Agency leaders have blamed turnover for some of the institutional problems detailed by the federal audit. These employees investigate grisly deaths and dismemberments. They deal with heartbroken families and contentious companies. Entry-level pay for the job, which requires a college degree, starts at $30,000 a year. According to a state database, even the most experienced officers make about $55,000. And a little experience working for the state can translate to double or triple the state salary in the private sector. Donta said inexperienced compliance officers often have to train the next class; compliance officers quit in the middle of investigations; and many work a second job to make ends meet. This is a problem every state grapples with, said Barab, the Obama-era OSHA director. Experts and former employees agree that to hire, train and retain inspectors, KY OSH would need more money. Funding levels have increased slightly over the last few years, but federal budget cuts to OSHA haven’t helped. Even though state plans are only required to match federal funds, Kentucky already contributes twice as much as the feds do. 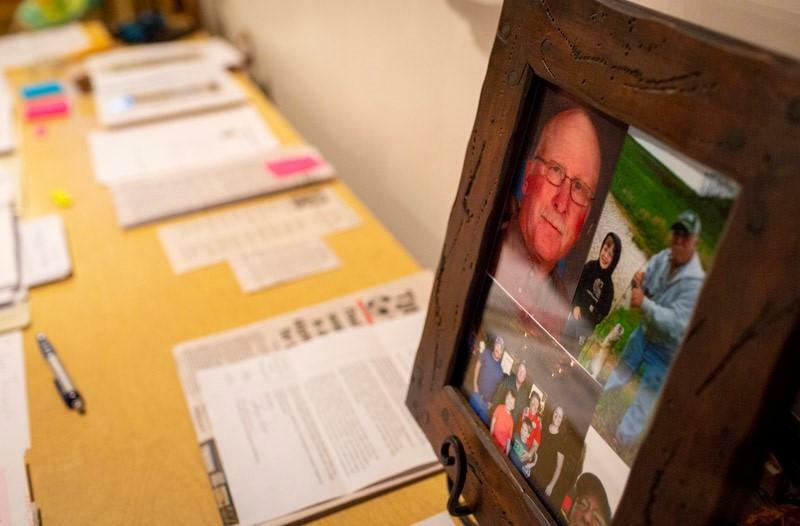 Lisa Hobbs's table is covered with documents and articles relating to her husband and his death. Gene Hobbs was run over by a coworker on a construction site in December 2016. In the basement of the house at “Camp Pius,” the farm that has been in her husband’s family for generations, Lisa Hobbs has a table. It’s covered in neat piles of documents, tabbed and highlighted, laying out everything that has happened since her husband was run over in December 2015. There’s the obituary, the commendation the county awarded him posthumously, the police report. She kept meticulous track of the dates and documents, injustices and victories. In May 2018, one of those victories came in the form of a federal report. She had filed a complaint with federal OSHA, alleging that KY OSH had mishandled the investigation into her husband’s death. This was the response from the federal office in Nashville. Cochran declined an interview request through a spokesman. His report identified multiple possible violations against Meade County, including training violations, management inspection violations and a sweeping violation for failing its duty to protect employees. And as for that backup beeper, which the police and Turner agreed wasn’t audible, the federal inspector found KY OSH didn’t do enough to verify whether it worked or not. “KY OSH should ensure that all available evidence is obtained and used to determine the facts at the time of the incident before developing conclusions and findings,” the report reads. Reading that report felt like a win for Lisa Hobbs. But in many ways, it’s too little, too late. On June 14th, what would have been her 43rd wedding anniversary, Lisa Hobbs stood in her front yard. She watched the same public works dump truck that killed her husband barrel down her country road. She listened closely as the truck reversed, and began to back down the street. “No damn beeper,” she said, shaking her head. More than a year and a half after Gene Hobbs was run over at work, she still couldn’t hear the backup beeper on the dump truck. KY OSH never told the county to fix it. Correction: Bill Cochran is OSHA area director. A previous version of this story had an incorrect title. Jeff Young, Jacob Ryan and Emma Collins contributed to this story. Eleanor Klibanoff can be reached at eklibanoff@kycir.org and (502) 814.6544.